Last week was a great day for Composed and I want to make sure the person behind it all is recognized. 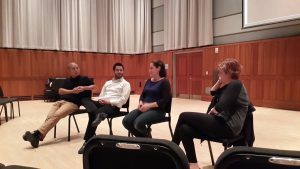 Two and a half years ago is when I first met Tom Reel when we made an appearance at ICSOM* (International Conference of Symphony and Opera Musicians) in Philadelphia. It was our first opportunity to speak about Composed to a room full of musicians and we were fortunate enough to be asked back a second time to preview the film before it’s official release in 2016. Tom was a part of this group of ICSOM musicians and is also a double bassist with the Virginia Symphony. Within the following months Tom was starting to put together an event we’d not dreamed possible, something that could connect the audience, the musicians, and the community to this film. 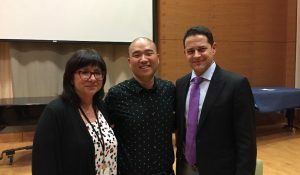 He contacted a local theatre and recruited a wonderful team of administrators from the VSO to help plan and promote the event. The event was complete with a sponsor, Optima Health, who got involved to offset the cost of the theatre and our screening fee. A local restaurant who offered 10% of their earnings to the VSO on the day of the event. A radio station that had musicians from the VSO and myself on to promote the evening. A string quartet who volunteered to perform before the film to both share their wonderful music and present a performance alongside our film. It was truly a culmination of people inspired by Tom to make this as successful an event as possible, and it was. Whilst originally intending to only share this with VSO musicians, Tom realized the potential for sharing it with the VSO’s community outside of just those in the orchestra. This ended up not only creating an important educational opportunity for the musicians but for their fans, students, and neighbors. 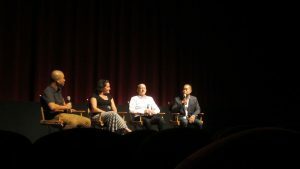 We were honored to take part in this event and hope others will let their audiences experience this film with their musicians to bridge a gap where people often forget musicians are people too with their own set of unique challenges. Many times I’ll spend a few minutes listening to their personal experience with performance anxiety and then try to offer some words of advice. This is where I often feel uncomfortable but preface my answers with “I am not an expert”. I do find myself at least attempting to offer some possibilities, but it’s a strange thing to be asked as if I’m an expert on this topic. Certainly it feels good for people to think so and I’m flattered but honestly I’m more of a sudo-expert. I’m like the guy who’s read the first few chapters of a lot of great books but who holds no degrees and has only spent two years being a student. I’m so grateful for all the things I’ve learned throughout this experience and will continue to try and share it as best I can but truly believe we need to invest in and support the real experts of this field. These people have dedicated their careers to helping musicians and understand how to make lasting change within this community. If you follow us on Facebook we’ll be profiling some of these amazing people and their resources throughout the coming months. We’ve already started to update our own resources page and appreciate the additional suggestions we received some weeks back. Today we hit the road again for 4 1/2 weeks to visit schools and orchestras from Baltimore to Miami. Campercar will be hosting us again this trip and we’re looking forward to visiting some more natural wonders on our days off, not to mention Disney World which Katie has never experienced. We start in Denver and have 25 hours before we hit Norfolk where the first screening of this tour will be hosted by the Virginia Symphony. If you’re in the area please come and join us (tickets here). There’s going to be chamber music, a screening, and of course a Q&A with musicians including Maestro JoAnn Falletta, one of our cast members. See JoAnn talking about the role of conductors when it comes to performance anxiety in one of our Composed Extras. The windows were fogged again this morning as we woke up for our last day of driving. The Walmart parking lot provided the trusty venue for our final night in ‘campercar’ before returning to our own bed in Denver. It’s been a five-week adventure that took us 7122 miles through eight states, five national parks, and to ten amazing music communities. It’s incredible how fast it’s all gone by but we always knew it would and have been taking stock on a regular basis of this amazing journey we’re on. In about a week we’ll be hitting the road again and this time headed for Norfolk, Virginia where we’ll be starting another run of screenings with the Virginia Symphony. Campercar will be our home for most of the time again this trip and we’re glad to have it. You’ll hear more about our travels in a video Katie is working on but in the meantime here are a few others things that happened during our time in California, Texas, and the Southwest. – Saw a gas station with 60 pumps. Sixty! The whole time we’ve been traveling I’ve noticed a distinct difference in each of the music communities we’ve visited. Being in California and then Texas you can’t help but see a vast shift in culture both in and outside of music. Many times we’d see this difference during the Q&A portion of our events. A big part of this was what goals were being nurtured the most at each institute. Many schools were focused on auditions and professional orchestral settings while others focused on music education. At one school in Texas we learned of how massive the music education system is across the state and presented to a room purely made up of music education majors. We also learned of TMEA too late but heard there was over 35,000 attendees! It’s been great though to see how, regardless of the desired path, musicians are interested in having this conversation as part of their education. Some will be teachers and some will be performers and most will do both so having an awareness and tools to address this issue can only improve our ability to discuss it openly within music community. “We’re about to be pulled over, I just went way too fast by that cop and he’s turning around” (cue fight or flight response). Sure enough in about 10 seconds the cop came speeding around the corner behind us with lights going full blast. At this point my palms are no longer sweaty and I’m smiling. Both as a result of this response that’s just floored me from the guy with the gun on his hip, but also because I could see him printing out a warning as opposed to a ticket, yes! The officer and I talked for a few minutes more before he handed me the warning and wished us a successful trip. He had clearly thought a lot about this and I have to imagine he encounters anxiety on a regular basis both in the people he serves and perhaps his colleagues. All told the experience was memorable for a few reasons but really left me wondering how important these conversations are for daily life. I’ve taken away a whole new sense about my anxiety after these last couple years and wonder how we might apply all we’ve learned to the population outside of classical music… Food for thought and perhaps a start to what documentaries may lie ahead for us. “Hey… the brakes aren’t working”, “WHAT!” I meant to say they’re not working as well as they did a day ago, whoops! No problem though, as we found a mechanic in a couple hours and had a caliper replaced that was rusted open (no longer pressing pads to the rotors). After that it was smooth sailing fortunately and the rest of our California driving was spectacular. A recent set of much needed rain storms had turned the hills and coast a bright beautiful green. After arriving in San Fran and catching up with friends we took Composed to the San Francisco Conservatory. We were happy to see almost a full house that included many of the musicians from the San Francisco Symphony. We’re encourage that audiences seem to be growing but what’s more is that the dialogue we’re seeing after the film is becoming incredibly important as well. These past few screenings we were inspired by how open and honest the conversation is becoming amongst students and professionals. Now for a little break. With so much driving and travel sometimes we need to escape into natural beauty and over the next few days as we drive east to Texas the goal is to visit three National Parks (Got to support our National Parks!). Visiting Saguaro, Guadalupe Mountains, and Carlsbad Caverns National Parks. 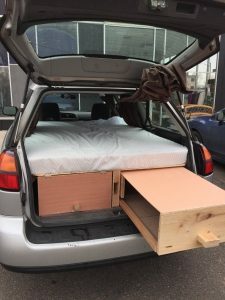 The second part of this adventure and another part of saving is a simple conversion to our car that allows for easy camping whenever we’re in a beautiful area. I promise I didn’t force my wife to do this by the way, she’s been on board since day one and even though our purpose is to share this film we’re happy to take advantage of some beautiful camping along the way. Months of editing indoors and we can’t wait to get outside. When building the campercar (that’s what we’ll call it for now), we were hesitant to share with anyone outside of our family the fact that we may be sleeping in our car while on this tour, but though we originally promised this newsletter would be for exclusive content and news, we thought it’d be nice to share some behind the scenes stories with our fans and supporters. Katie, the film’s editor, has decided to produce some video diaries of the trip so stay tuned for those. We appreciate you supporting us on this incredible adventure. We look forward to sharing more behind the scenes stories, exclusive video extras, and the latest tour announcements. Coming back to Boston brings with it some of our proudest accomplishments. Firstly, Boston University is my alma mater and where I learned so much about music and filmmaking. With BU’s recent sponsorship of the film and now their screening, it feels like a homecoming I never thought possible. To see how supportive they’ve been is a testament to where they’re headed and what kinds of resources they want for their students. The BU screening is Dec 7th at the Sleeper Auditorium. Start 6:30pm and is FREE and open to the public. Secondly, our screening at Harvard University has been confirmed for Dec. 6th at 6pm and is also FREE and open to the public. Harvard… the most prestigious education institute in the world… Hosting us.. What?! Of all the dreams we’ve discussed of where this film could go and what it can accomplish, a screening at Harvard was not on that list. 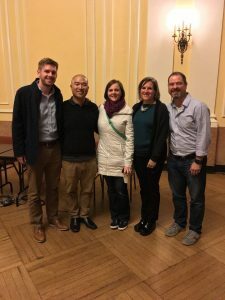 Lisa Wong, of Harvard Medical School’s Arts and Humanities Initiative, saw our film at the NEC screening in October and knew it could help her students too. It’s a major milestone in the life of this film and one we’re so incredibly proud of. Time to take a deep breath and look around! Two years ago we had so much hope for this project but only one interview scheduled. We knew the next year was going to be tough, but never thought it would in fact take twice that to complete. 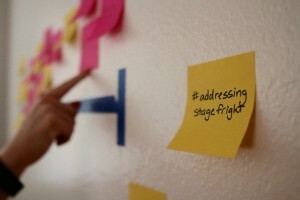 Yet throughout the project the dream remained the same, to entertain and engage an audience with something we made. Could it change people’s lives? Could it have a real impact? Would people really sit for an hour and watch something we made? Now after 8 screenings of the film our dreams have become reality. More and more we hear the words “thank you” after presenting the film. Most filmmakers dream of hearing “that was good”, but to hear someone say “thank you” resides on a level we weren’t sure was possible with such limited resources. As we look back on these first couple weeks it still seems like we’ve just gotten lucky with a film that the music community has been waiting for. We don’t know yet what the life of the film will be but one thing is for sure, that it truly has the power to help and we couldn’t be prouder. Three screenings into the tour we’ve become more and more confident that this is a film that can really help the musician community. The sincere and genuine feedback has been so incredible and meaningful after spending these past two years wondering how it would be received. It’s been clear from the discussions and feedback during the Q&As at each screening that the music world is hungry to discuss this topic. Although we are encountering so many of these amazing interactions we are still in the “selling” phase of this journey and must admit it’s the least fun of the phases so far. The response and reactions make everything worth it, but wouldn’t it be nice as artists if we didn’t have to “sell” our work. We are of course just starting out and managing how best to spread the word… but musicians in many of the institutes we’re visiting now have entrepreneurship programs specifically designed for this part of the process. What an amazing gift and a sign of changing times in these organizations. We’ve been so happy to see so many schools, regardless of their desire to screen Composed, taking a proactive position on training students for the real world of professional music making. Whether that’s how to do you taxes as a freelancer or how to market a concert on your own, it’s inspiring to see this available. Some of course still believe no change is necessary but the majority we’ve noticed understand the benefit of investing in training outside of the notes. Artists vary in their passion for the research, production, and presentation of their work, but most aren’t fans of selling it. With so much vying for our attention these days we are still figuring out how best to convince musicians our film isn’t just for those “with a problem” but for anyone wanting to take advantage of the mental side of performing. Athletes for years have known the power of mental skills training and there’s no reason we can’t take advantage too. When people used to ask me what hopes I had for the film’s distribution I always talked about a tour where we’d visit every city in the country. We’d start with conservatories and schools of music to get the film to students in the midst of auditions, recitals, and performances. From there we’d speak to orchestras and musician communities before launching a public run of the film. So far we have 14 screenings booked over the next 7 months with more to be announced soon. They include some incredible institutions, orchestras, and venues that were part of those early dreams. So indescribable the feeling of watching as this dream becomes a reality piece by piece. Tomorrow we leave for Boston, my home town and home of many of our country’s most prestigious music institutes. The Boston Symphony, Boston University, New England Conservatory, Boston Conservatory, Berklee College, and many others make this an incredible place to discover classical music. Returning and sharing our film feels like giving something back to a community that gave me some of the greatest musical experiences one could ever imagine. October 11th we screen for the first time at the New England Conservatory and we hope to see you there! NEC has opened it’s venue to the public and are proud supporters of this film and it’s message. The response to our newest trailer has been amazing! In just 5 days we had a combined 13,000 views on youtube and Facebook, over 160 shares, and reached 40,000 people! Our ambitions for this project started so humbly, hoping that perhaps our friends and family would attend a small screening when we were finished and maybe we could help a couple musicians too. Now after the reaction we’ve just seen there’s no doubt that musicians want to talk about performance anxiety. The next step is convincing schools and organizations that this is worth bringing to their communities even if they themselves do not suffer from performance anxiety. Sadly many of the schools we’ve contacted have been uninterested in screenings but equally some could not be more excited. Soon we’ll start posting locations, dates, and times to our tour page and hope more schools will realize the importance of this conversation. Composed is happy to announce the addition of Boston University as our newest sponsor. Boston University is the first education institute to sponsor our project and we couldn’t be prouder. Our director, John Beder, is a graduate of BU’s College of Fine Arts as well as an alum of the Boston University Tanglewood Institute and Boston Youth Symphony Orchestra, housed at BU. More information will be available soon, but Composed is also in talks about a screening at BU this fall. 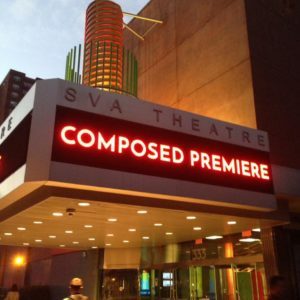 In just over a months time delegates at the 2016 ICSOM* conference in Washington DC will get a first look at Composed. A special preview of what we’ve been working on will be shared at the conference to show this amazing group of musicians what they’ve helped create and what’s coming this fall. ICSOM is a sponsor of Composed and also helped us gather the newest information on the health of classical musicians. The 2015 Musicians’ Health Survey was an updated look at a similar study performed back in 1987. Almost 450 musicians from orchestras around the country participated in helping us to better understand the state of our classical performers. We’re happy to announce that some of the results of this survey will be shared with delegates at this year’s ICSOM conference. You can also learn more about the results as they’re announced through Facebook and twitter. Step 1. Become incredibly overwhelmed with how much footage you have. Step 2. Become incredibly excited by how much footage you have. Step 3. Organize. Step 4. Start with the edges and work your way in to the middle. Editing is by far the most difficult phase of this project, but equally the most exciting. 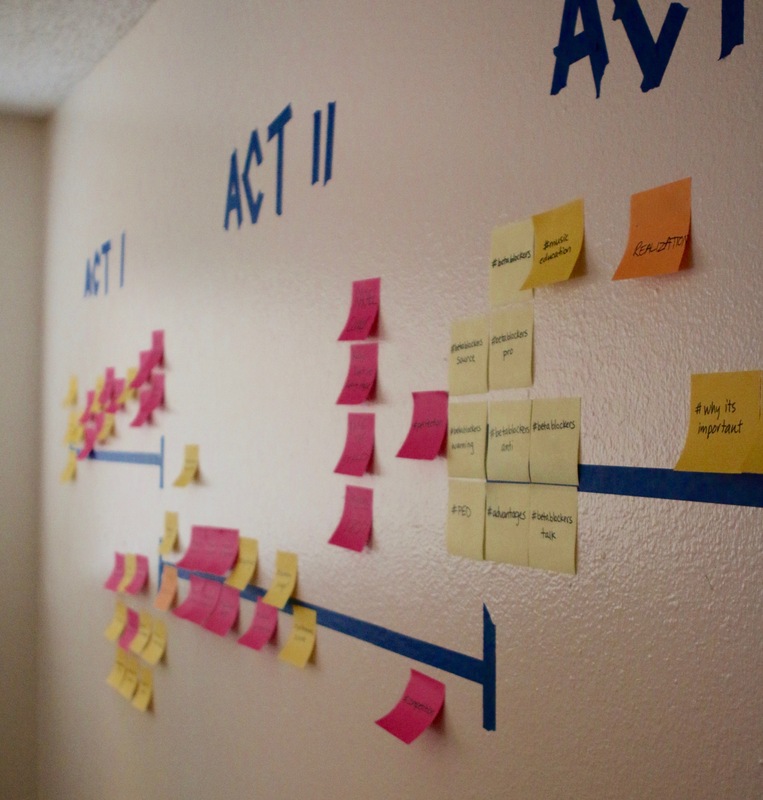 We’re in full swing editing and piecing together this great big puzzle laid out across our office walls. Using post-it notes to mark themes and story points we’re not only trying to highlight our cast’s advice but tell a story that’s inspiring, endearing, and represents a well rounded look at performance anxiety in classical music. Organizing and transcribing all the footage was difficult but ultimately freeing now that we can see what colors we have to paint with. Some are incredibly specific while some have broader appeal, but regardless we are faced with deciding what’s the most important, what has the most potential, and what will be left on the cutting room floor. This responsibility is exciting of course but also leaves me questioning what makes me qualified to say whats “most important”. Just talking to musicians during these past months has made it clear that the approach to this issue can be so varied and spark intense debate in many cases. I suppose most documentary filmmakers encounter these questions, but for now I’m trusting my gut and working piece by piece.